THB 27,000 / 10 Vouchers. Monday - Friday , excluding public holidays. THB 36,000 / 10 Vouchers. THB 17,000 / 10 Vouchers. Tuesday - Sunday , excluding Monday. THB 30,000 / 10 Vouchers. THB 12,000 / 10 Vouchers. THB 25,000 / 10 Vouchers. Card fee THB 250 for new membership. and will be expired on one year from issue date. Tel. +66 2750 2112 for more information. 1. Unlimited refill E-vouchers for any promotion of smart card. 2. Receive 15% discount for day golf green fee and 10% discount for night golf green fee from regular rate. 3. Receive 10% discount for a la carte menu for food only at The Fountain Restaurant Bar & Restaurant. 4. Receive 10% discount for accommodation from regular rate at Summit Windmill Golf Residence (All suite hotel & residence). 5. Receive 15% discount on any treatment at Explore Spa Le Meridien Suvarnabhumi Bangkok Golf Resort & Spa. 7. This card or E-vouchers cannot be combined with any offer/discount or other promotion. 8. All E-Vouchers cannot be exchanged, refunded, replaced or redeemed in any way for cash. 9. 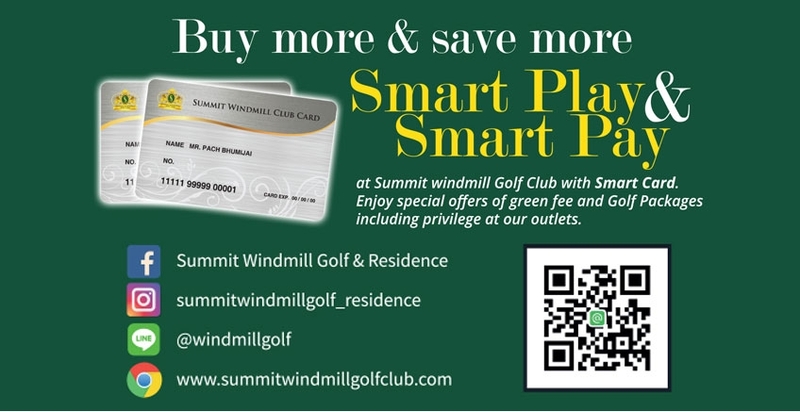 The Summit Windmill Club Card can be used at Summit Windmill Golf Club and participating hotel & outlets only. 10. The Membership of Summit Windmill Club Card is not Membership of Summit Windmill Golf Club. 11. The card holder must be present this card prior to purchase or receive any discount at the point of sale. 12. The E-Voucher is valid from 1 year of issue date. Day Golf : Monday - Friday from 6.00 a.m. - 2.00 p.m.
Saturday - Sunday and Public Holidays from 6.00 a.m. - 1.04 p.m.
Night Golf : Tuesday - Friday from 4.00 p.m. - 8.00 p.m.
Saturday - Sunday and Public Holidays from 5.30 p.m. - 6.18 p.m. Twilight Golf : Tuesday - Friday from 2.30 p.m. - 3.34 p.m.
Saturday - Sunday and Public Holidays from 3.36 p.m. - 5.20 p.m.
14. This E-Voucher entitles to you an 18 hole round golf and one E-Voucher can be used per transaction. 16. We reserve the right to discontinue E-Voucher at anytime or to modify any voucher terms and conditions without notice.